TORONTO – As Kawhi Leonard took to the podium on Monday morning, finally speaking publicly for the first time since he was acquired from San Antonio in mid-July, Raptors fans let out a collective sigh of relief. Not long after, the team did the same. Media day went just about as well as they could have expected, mostly because they didn’t quite know what to expect. It wasn’t entirely clear what Leonard would say, how much he would say, or even when he would be ready to break his silence. 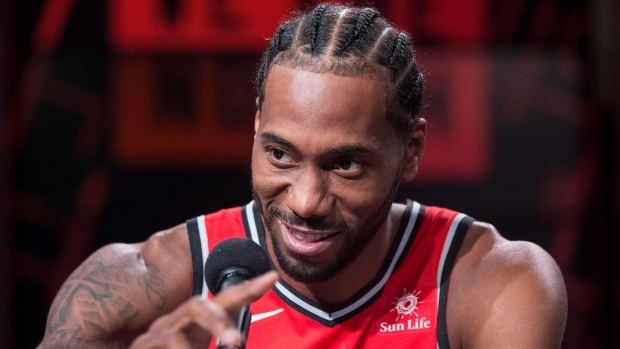 According to multiple sources, Leonard’s camp had rebuffed the Raptors’ many attempts to formally introduce him to the media following the trade. For what it’s worth, the team didn’t see that as a reflection of his desire – or lack thereof – to be in Toronto, and neither should you. That’s just Kawhi. Famously, he’s a man of few words. Kyle Lowry, the team’s incumbent star, had declined to comment on the trade of his close friend and long-time teammate DeMar DeRozan at a USA Basketball minicamp in Las Vegas over the summer. That was overblown and not a direct concern to the team – as Lowry correctly pointed out on Monday, he’s never made a habit of speaking to the media during the off-season. Of greater concern, per league sources, Lowry had also been dodging calls and texts from team officials, including president Masai Ujiri and new head coach Nick Nurse, who Lowry said he only spoke with briefly right after Nurse was promoted in June. Meanwhile, Lowry and Leonard didn’t speak until Monday morning. But here they were – in the same building, seemingly on the same page, preaching the same things, and sharing the same level of excitement for this upcoming season. They said the right things. Leonard insisted he was pleased to be coming to a great organization and a city that’s passionate about basketball. Lowry said he’s happy to be part of a team that has a real chance at doing something special. Leonard even broke a smile or two. The most encouraging thing for the team and its fans was how sincere it all came off. That may have come as a relief but, for the Raptors, it wasn’t exactly a surprise. Despite the chaotic summer and minimal off-season contact with their best players, they’ve maintained confidence that once they get back to work a common interest would bind them: their drive to win. For at least one day, that shared goal proved to be bigger than any of the uncertainty hanging over the franchise ahead of its most important campaign to date. Provided everything breaks the right way, the Raptors have a real shot at making it out of the LeBron James-less Eastern Conference and competing for a championship – something that’s not lost on either of the team’s star players, or the supporting cast. If talent rules the day, they’re going to be really good, with a chance at being great, and the tenuous foundation of their revamped roster is depending on it. Winning solves a lot of problems, in most cases before they even become problems. Is Leonard destined to take off for Los Angeles next summer? That question will linger all season long, but he’s obviously far more likely to stick around if he and the team enjoy a successful year together. Will Lowry continue to be a good soldier? Will some of their depth of talent off the bench buy into playing spot minutes for the good of the team? As long as things are going well, it’s easy to see them coming together and, most importantly, staying together. However, what if they get off to a slow start, which is certainly possible given the newness of the roster and the experimental nature of their new head coach? What happens when adversity hits? There’s a wide range of possible outcomes for the 2018-19 Toronto Raptors. If they top out as a legitimate contender to win the East, what’s their floor if things don’t come together as they hope? That disparity is a function of the calculated risk they took in trading for Leonard – something of a wild card after missing all but nine games with a quad injury last season and then forcing his way out of San Antonio – and shaking up the chemistry in a tightly-knit locker room. Leonard said he’s healthy and itching to get back in the gym, which is a promising first step. On Tuesday he and Lowry will share the court for the first time as teammates, with the Raptors opening training camp in Vancouver. Even without an existing relationship to lean on, they’re hoping it won’t take long to learn from one another. They’ve got a common denominator with which to start.